This gorgeous antique sterling silver scent bottle is ornamented with a floral and leaf design that wraps around the bottom of the piece. 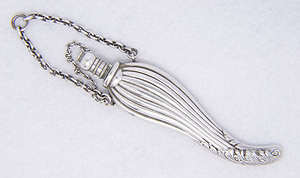 Meant to be worn as part of a chatelaine, the scent bottle measures 4” in height and 1” in width. Circa: 1880.